On this day…change can happen ! Can the nuclear Siamese twins be separated? 29 May is a memorable date indeed. On this day, in 1953, two men for the first time reached the summit of Mount Everest and conquered the top of the World. Similar feelings of exhilaration and relief (and also of exhaustion) prevailed on that same day, in 2008, when 107 States adopted the Convention on Cluster Munitions (CCM) in Dublin – a treaty that outlaws virtually all cluster munitions that have been used to date, provides for assistance to victims, the clearance of contaminated land, and the destruction of existing stockpiles. Today’s launch of the report ‘Banning Cluster Munitions – Government Policy and Practice’ marks the first anniversary of the CCM’s adoption and the beginning of the Global Week of Action on Cluster munitions. The 288 pages long report was written by Human Rights Watch (HRW) in partnership with Landmine Action and produced by Landmine Monitor. Compiled in record time, the report gives an introduction to cluster munitions, the ‘Oslo Process on Cluster Munitions’ and to the CCM itself. It provides up-to-date figures on cluster munitions use, production, stockpiling, transfer and disinvestment in cluster munitions manufacturers. And, most importantly, it documents government statements, parliamentary actions and civil society initiatives on cluster munitions in 150 States, that is, all States that took part in the ‘Oslo Process', and all States that are known to stockpile cluster munitions today. ‘Change can happen!’ exclaimed the representative of HRW at today's launch event. The report provides a historical record of how numerous States’ policies and practices on cluster munitions have changed over the course of the last few years. To date, 96 States have signed the CCM, of which 35 have at some stage in the past used, produced, stockpiled or transferred cluster munitions. And 7 States have already ratified treaty. Several more have indicated that they would deposit their instrument of ratification shortly, so that the treaty can be expected to enter into force in 2010. Importantly, as the report notes, policy shifts also took place in States not involved in the ‘Oslo Process’. The U.S., for instance, has recently enacted a permanent ban on cluster munitions exports. Such practices also contribute to the stigmatization of cluster munitions as weapons that are unacceptable because of their negative humanitarian impacts. The report will also serve as a baseline for the future implementation of the CCM by State Parties. Remarkably, Spain has already destroyed all of its cluster munitions stockpiles, even prior to the treaty’s entry into force. This bodes well for the effective translation of treaty obligations into concrete national implementation measures, and several other States are expected to destroy their stockpiles in the course of 2009. In support of the timely implementation of this particular treaty obligation Germany will host a Conference on the destruction of cluster munitions stockpiles in Berlin next month. Change also happened elsewhere in Geneva today: after a decade-long struggle, the Conference on Disarmament (CD) finally adopted a Programme of Work! Some diplomats already suspect they will soon remember with fondness the days of fruitless discussions and blockage in the CD in view of the daunting negotiations that lie ahead of a treaty banning the production of fissile material for nuclear weapons - the only negotiation mandate included in the Programme of Work. But the adoption of the CD's Programme of Work is a major breakthrough, and after an exhausting week for the Geneva disarmament community, with the Mine Ban Treaty Standing Committee Meetings and the CD going on at the same time, those diplomats who drew the short straw and had to go to the CD were rewarded this time, taking part in an historic event. References: 'Banning Cluster Munitions: Government Policy and Practice' by HRW, Landmine Action et al., May 2009. "Atoms for peace and atoms for war are Siamese twins." From the very outset of the nuclear age, the challenge has been to facilitate the civilian use of nuclear energy while curbing nuclear weapons. But, as Robert Oppenheimer once observed, “the close technical parallelism and interrelation of the peaceful and the military applications of atomic energy” make countering nuclear proliferation an especially difficult task. At the heart of the problem is a large overlap between civilian and military applications of nuclear energy, which both depend essentially on the same key ingredient: fissile material. Today the world faces the prospect of a nuclear “renaissance” – a potential expansion in the use of nuclear energy worldwide. Energy supply is a critical economic, national security, and environmental issue for our planet and nuclear energy could be a vital part of the energy mix providing energy in quantities needed to decrease our dependence on fossil fuels. We don’t know now if there really going to be a nuclear “renaissance” and what form it will it take. But the revival of interest in nuclear power could potentially result in the worldwide dissemination of uranium enrichment and spent fuel reprocessing technologies. This presents obvious risks of proliferation as these technologies can produce fissile materials – high enriched uranium and separated plutonium – that are directly usable in nuclear weapons. As a result more states could acquire the capability to produce materials directly usable for, or easily converted to, explosive use. And they can do it completely legally. Article IV of the Treaty on the Non-Proliferation of Nuclear Weapons (NPT) guarantees “the inalienable right of all the Parties to the Treaty to develop research, production and use of nuclear energy for peaceful purposes”, including technologies of uranium enrichment and fuel reprocessing. The International Atomic Energy Agency (IAEA) seeks to inhibit the use of nuclear energy for military purposes through the system of international safeguards. But the acquisition of uranium enrichment and spent fuel reprocessing facilities would bring states a long way toward nuclear weapons even without directly violating the NPT, namely without “diverting” special nuclear material and, therefore, without any possibility of being restrained by IAEA safeguards designed to verify whether material has or has not been diverted. One does not have to look far for an example. Japan is currently the only non-nuclear-weapon state that operates all the elements of the complete nuclear fuel cycle. It has a very advanced nuclear infrastructure, including commercial-scale enrichment and reprocessing plants, large quantities of nuclear material (more than 45-metric tons of separated plutonium), modern nuclear scientific, engineering and production capabilities. It’s to Japan’s credit that it has a perfect NPT compliance record and has pursued a consistent policy of non-weaponization of nuclear technology. None of this changes the reality that the country is a “screwdriver turn” away from acquiring nuclear weapons – in months rather than years – if it took the political decision to go nuclear. Indeed, periodically this question resurfaces in Japan and just recently several retired military officials argued that the country should consider possessing nuclear weapons. Should a nuclear “renaissance” result in more non-nuclear-weapon states acquiring enrichment and reprocessing facilities, the task of safeguarding such facilities could place significant additional work load on the IAEA – already strained both in budget and personnel. Moreover, safeguarding commercial-scale enrichment and reprocessing plants poses significant verification challenges. That’s because large plants process so much nuclear material over the course of their operation that it’s very complicated to make accurate material-accountancy measurements as part of ensuring none of this material has been diverted. Moreover, if a Fissile Material Cut-off Treaty (FMCT) is negotiated and agreed, its verification could mean placing under safeguards enrichment and reprocessing facilities in the nuclear-weapon states and non-NPT states, which now are mainly outside the international safeguard system. All of this will require resources and strategic foresight. All of this said, nobody should contest the right of any nation to utilize nuclear energy in a secure, safe and environmentally sound manner. So key questions are these: how should the international community address the growing security and proliferation risks from the nuclear fuel cycle? How can the international community limit access to sensitive nuclear technologies, all the while protecting states’ rights to develop the peaceful use of nuclear energy? Continued nuclear development along national lines – the situation we have now – presents a sort of 'Catch-22' because it will create additional proliferation risks undermining the international nonproliferation regime. Even if a large-scale nuclear “renaissance” doesn’t occur, it would not help much. Many countries would not willingly agree to indefinitely preserve the de-facto existing “two-tier” system where some nations – essentially the members of the Nuclear Suppliers Group – are entitled to nuclear fuel cycle technologies, and others are not. Some of them may decide to acquire their own enrichment or reprocessing capabilities, decisions perhaps for political and national strategic reasons rather than primarily driven by economic considerations. So, how is the nuclear puzzle to be solved? Let’s go back to 1946, when The Report on the International Control of Atomic Energy (generally known as the Acheson-Lilienthal Report) appeared. At the time, the report contained a stark warning: “A system of inspection superimposed on an otherwise uncontrolled exploitation of atomic energy by national governments will not be an adequate safeguard”. The Acheson-Lilienthal report was the first effort to define a policy on the international control of atomic energy. But, in the condition of the time, the task of establishing some form of international authority over the most dangerous aspects of the nuclear fuel cycle proved impossible. Instead, the international community eventually adopted the very approach - occasional inspection by the IAEA - criticized by the report’s authors. More that sixty years later we face the same problem, only on a much bigger scale. And again it seems that multilateralization can offer a gateway to nuclear fuel cycle services for any nation. A multilateral approach to the nuclear fuel cycle, if appropriately arranged, has substantial potential to ensure that the benefits of nuclear energy are made available to all states, while strengthening the nuclear non-proliferation regime and reducing incentives to build new nuclear fuel cycle facilities in states that do not now have them. The rationale for multilateral approaches to the nuclear fuel cycle is relatively straightforward. In the case of a multinational enrichment or reprocessing facility, in which ownership, control or operation are shared among a number of states that can watch each other, all of its participants are under a greater degree of peer scrutiny. This would make it more difficult and riskier to cheat. The possibility of seizure of the facility by the host country would always be present, but because of the ensuing confrontation between that country and the other participants and the international community, a considerable political barrier inhibits such action. The use of multinational facilities instead of an array of national facilities would reduce the number of plants to be placed under safeguards, increasing the feasibility of continuous inspection while possibly reducing costs of these inspections. Multinational facilities could also serve as confidence-building measures, helping to reduce suspicions among participating states about each other’s nuclear weapon intentions. Moreover, large multinational fuel cycle facilities could be cost effective and provide economies of scale smaller national facilities would probably lack. Multilateral fuel cycle mechanisms could respond to the “entitlement” motivation of the customer states in terms of their participation in ownership, management, operation, decision-making, profit-sharing, and so on. The task is tremendous: it is not easy getting international support for dramatic changes in the way we use nuclear energy. Nonetheless, we have no choice if the world is to be protected from the misuse of sensitive nuclear technologies. To begin with, the international community should conduct in-depth discussions and thorough analysis of the technical, legal, political and economic aspects of various proposals and ideas for multilateral nuclear fuel cycle frameworks. The long lead-times for nuclear construction allow us to do that. But states involved cannot allow themselves just to waste this time indulging in endless and selfish politicized arguments. This is a guest post by Dr. Yury Yudin. Yury is a Senior Researcher at UNIDIR and manages the project ‘Multinational Approaches to the Nuclear Fuel Cycle'. A pre-publication version of his new study paper, 'Multilateralization of the Nuclear Fuel Cycle: Assessing the Existing Proposals' is available in PDF format by clicking here. 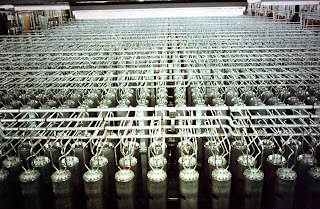 Picture credit: photograph of a centrifuge cascade (part of the nuclear enrichment process), courtesy of the IAEA's Image Bank. It's hard not to feel a little bit like Cinderella at the moment as I plug away on completing a manuscript of a history of the Oslo process on cluster munitions, which is due to be published later this year by the United Nations. As I stare bleary-eyed and punch drunk at my computer screen, interesting developments for disarmament are happening on a couple of different fronts, one being the Nuclear Non-Proliferation Treaty (NPT). Since he assumed office, there has been great optimism among many pundits (and a certain amount of dismay among some of the conservative Gaffney-types) that U.S. President Barack Obama would assume a much greater leadership role than the previous Bush administration on efforts at the multilateral level toward nuclear disarmament. Obama seems to have become president in the middle of something of a 'perfect storm' - with a global financial crisis (including the near bankruptcy of huge American carmakers GM and Chrysler), a deteriorating security picture in Afghanistan and Pakistan, the ongoing Iranian and North Korean nuclear sagas and even a swine flu pandemic outbreak. Obama versus the four horseman of the apocalypse it would seem. So one might be forgiven for thinking that the Obama administration might put good intentions about nuclear leadership on the back burner. And talk is cheap. The truth is, that until the NPT Preparatory Meeting that began at the beginning of last week in New York, no-one outside the U.S. government really knew what kind of tone the new administration would try to set, especially as its ambassadorship to the Conference on Disarmament has been empty, and it has generally kept pretty quiet in Geneva so far this year. I attended parts of last year's second Preparatory Meeting in Geneva, and to be honest it was a bit of a depressing spectacle. Nevertheless, but for infernal book writing I would love to have gone to New York this May to see if the atmosphere has changed. By various accounts, the U.S. delegation, led by Rose Gottemoeller, seems to have set a very positive tone, reading a message from President Obama to the meeting, and delivering an assessment of the U.S.'s basic positions on the disarmament, non-proliferation and nuclear energy pillars ot the NPT. "She reaffirmed that the U.S would seek ratification of the Comprehensive Test Ban Treaty and negotiations on a Fissile Materials Cut-off Treaty. Most importantly, she reaffirmed the decision to extend the NPT in 1995 and decision made at the 1995 and 2000 Review Conferences, including the 1995 Middle East resolution." "The amount of time remaining could possibly allow for a second revised document to be offered Thursday afternoon, giving the PrepCom a last chance to adopt it Friday afternoon. However, if the Committee cannot agree to adopt the revised document on Thursday, it is likely that the Chair will have to forward it to the RevCon as a working paper, despite his aversion to such a solution." Reaching Critical Will (which is a project of the Women's International League for Peace and Freedom) also did great work in reporting on the Oslo process, which delivered the Convention on Cluster Munitions (CCM) last May in Dublin, and which we also covered extensively on this blog. There are positive developments on the CCM front too. The CCM needs 30 ratifications to enter into force. 94 states signed the treaty in Oslo last December, and now the count stands at 96 with seven (Austria, The Holy See, Ireland, The Lao People’s Democratic Republic, Mexico, Norway and Sierra Leone) having ratified. This is actually pretty good going, given the challenges involved in national legislation processes. It now looks like two pretty big countries - Germany and Japan - are likely to ratify by the end of May. This is great news, as is Germany's commitment to hosting a conference on cluster munition stockpile destruction issues in Berlin in June. And ratification is in the pipeline for a bunch of others, with results starting to emerge before the summer recess. It means we could be looking at international entry into force of the CCM sometime in early 2010, all going well. Lao PDR (the most cluster munition affected country - bombed to smithereens in a secret U.S. bombing campaign in the 1960s and early 1970s) has offered to host the CCM's first meeting of states parties, which underlines the commitment of affected countries to the treaty. I believe planning for the meeting has (wisely) already started. Under the Bush administration, the U.S. shunned the Oslo process, although American legislators like Leahy and Feinstein have been very supportive of it. It'd be great to see some of Obama's magic bridge-building in the context of the the CCM too. 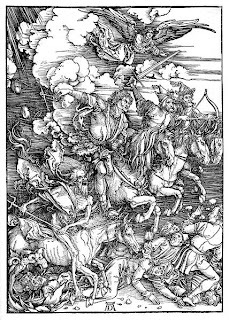 Picture credit: Albrecht Dürer's The Revelation of St John: The Four Riders of the Apocalypse, 1497-98, Woodcut, 39 x 28 cm, Staatliche Kunsthalle, Karlsruhe. Image downloaded from Wikipedia. Since the tragic school shooting in the German town Winnenden in March this year, computer war games have again been a frequent item on the Swiss news; some cantons are now considering whether to ban or regulate so-called ‘killer games’ that reward cruel violence against humans. This got me thinking about what I associated with the ‘good’ aspects of war games – the challenge of thinking strategically. While I grew up with games of chess and risk, I imagine that thousands of keen minds are calculating their next moves in complex interactive computer war games as I write. Thousands more will be addressing domestic ‘governance’ dilemmas in games like Civilization or SimCity. I don’t, however, think that many are engaged in virtually building peace after war. Although the use of the information and communications technology for peace (ICT4peace) has been well documented, and is the subject of a new blog, I have not found examples of games that simulate peacebuilding or post-conflict state-building. This is a pity. It is a missed opportunity for gamers because the peacebuilding challenge is a great test of strategic skill, combining the challenges of governance with those of war-fighting. If war to Clausewitz was ‘politics by other means’, then peacebuilding is to the parties to a conflict often an experiment in ‘war by other means’. In other words, it is based on a rational calculation by the parties that they will benefit more from the peaceful pursuit of politics. The objective of a virtual peacebuilding game would be to achieve a just and sustainable peace. You would loose if a significant number of the actors revert to violence as a means of pursuing their interests. Your score would depend on the extent that you manage to marry stability with reform. For instance, you will get extra points for also navigating the challenges of ‘right sizing’ the army, reforming the civil service, holding elections, and luring in development assistance as well as private and public investment. Beginners could choose a simple version with a small number of actors and hints in the form of a comprehensive peace agreement, and a plan for its implementation. More difficult levels of the game might increase the number of parties to the conflict and divide external actors, giving each somewhat different preferences. It might also introduce factors such as the presence of high-value natural resources that raise the stakes of being ‘in’ government. The most difficult levels might model peacebuilding in the midst of war – where war-fighting games are combined with peacebuilding ones. Whether this was designed for a single player with the ability to manipulate all actors, or multiple players each assigned to one party, it would present the player with engaging dilemmas and strategic calculations of risk. Gaming peacebuilding does not only have entertainment or brain-teasing potential however. It also is of academic interest; it has the potential to improve our understanding of the strategic interaction between domestic and international actors in post-conflict situations. This has been done to great effect by Barnett and Zuercher in their article The Peacebuilder’s Contract: How External State-Building Reinforces Weak Statehood. In it, they model strategic bargaining between international actors, state elites and local elites in post-conflict contexts. Their model assumes a post-colonial context in which states (even before the conflict) had little legitimacy or capacity and where regime stability was underpinned by patrimonial politics. In this model political and economic survival of the state elites depends on the ability to co-opt or deter challengers from the periphery through an (expensive) patronage system. It is assumed that state elites want to maintain their power. External actors are unified and desire first and foremost stability and secondarily liberalization. Rural elites want autonomy from the state and to maintain their power in the countryside. The potential results of the ‘game’ include: co-operative peacebuilding, where local elites accept and co-operate with the peacebuilding programme introduced by the external peacebuilders (where there interests are aligned as, for example, in majority-Albanian parts of Kosovo); co-opted peacebuilding in which both peacebuilders and local elites have compromised their strategies to accommodated the preferences of the other (as in Tajikistan and the majority of other cases); captured peacebuilding where local elites are able to redirect the distribution of assistance so that it is fully consistent with their interests (typically in situation of instability where aid workers and peacekeepers are dependent on local warlords to carry out their mandates or access populations at risk); or conflictive peacebuilding - the threat of use of coercive tools by either international or domestic actors to achieve their objectives (where local elites obstruct the peacebuilding programme and peacebuilders are faced with considering coercive options or withdrawal, as has been the case in Northern Kosovo at times). Barnett and Zuercher show that when you play a ‘simple’ game between peacebuilders and state elites co-opted peacebuilding is the equilibrium solution in which neither actor has an interest in defecting. A game involving peacebuilders, state elites and local regional elites is more likely to end with co-opted peacebuilding between peacebuilders and state government and captured peacebuilding between peacebuilders and local elites. The outcome that rational strategic bargaining tends to result ‘co-opted’ or ‘symbolic peacebuilding’ but not fundamental state-society reforms, resonates because it matches the empirical record. There is strong evidence that the presence of international actors has helped promote stability and reduce return to violence, but the record also shows that international interventions have been far less successful at building ‘positive’ peace based on the liberal model of the strong state (see Doyle and Sambanis for statistical rates of success). This simple model also rings true when considering individual cases. Take the one that the West is currently most engaged in: Afghanistan. Barnett and Zuercher argue that in Afghanistan the peacebuilding ‘game’ was first characterized by co-operative peacebuilding between the new Karzai government and the peacebuilders (based on a weak government and an extraordinarily strong and generous external intervention) and captured peacebuilding between the rural elites peacebuilders (based on relatively strong elites and the fact that the US was also dependent on their co-operation for counter-insurgency purposes). As the power of the rural elites grew (in part as a result of the US war on the Taliban) state elites became increasingly reluctant to implement the liberal reforms that might alienate rural elites. Peacebuilders accepted these conditions because of their preference for stability. Gaming the strategic interaction of peacebuilding also has operational value. Of course those who are party to a conflict at the strategic and operational level are well aware of the complex politics of peacebuilding. Most peacebuilders that ‘work on’ the operationalisation of Disarmament, Demobilisation and Reintegration of former combatants (DDR), Security Sector Reform (SSR) or financial and administrative capacity building and reform should also be acutely aware of their intended and real impact on the dynamics of the peace process. But this is not adequately reflected in policy discourse. Rather, at the international level, policy discussions about peacebuilding are first and foremost linked with efforts to address how the international community should get its act together so as to maximise its leverage in peacebuilding contexts. These typically involves debates about how best to mobilise financial and human resources, and how to promote ‘unity of purpose’, including through strengthened international leadership and improved co-ordination. These are important issues, but they do not address the domestic politics of peacebuilding. Instead, the ‘demand-side’ of peacebuilding is effectively side-lined by invoking the principle of ‘national ownership’ – a conceptual place-holder for the domestic politics of the peace process. Similarly, the call for external aid ‘alignment’ with national priorities obscures much more than it reveals. Worse, much of the language of aid implies that building national capacity or aligning international aid priorities with domestic ones is a technical issue, when it is clearly political. We need policy frameworks that recognise the conflictual nature of peacebuilding rather than ones that suggest it is a co-operative exercise. If not, the danger is that the international community support those actors with whom its interests most align, without sufficiently considering the possible reactions of the actors who stand to loose by this alliance. 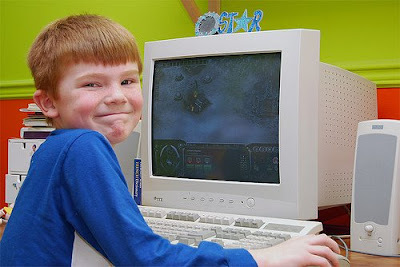 Perhaps it is unhealthy for teens to be playing too many ‘killer’ computer games. But I suggest that it may improve the lives of those living in states ravished by war if those that are thinking about intervening in their country spend more time in front of a screen thinking about the different motivations and choices of actors with a stake in the war/peace. Gaming might provoke more consideration about the underlying assumptions we make about how to build peace. It would also be a useful complement to traditional leadership training. These games may even be fun and make money. To all those gaming industry bosses who are reading this (not): Can we have some peacebuilding games please? Photo Credit: ‘Day 75: Liam playing Axis and Alies' by puremango on Flickr. Michael Barnett and Christoph Zuercher, The Peacebuilder’s Contract: How External State-building Reinforces Weak Statehood. Available here. Michael W. Doyle and Nicholas Sambanis, Making War and Building Peace, Princeton University Press, 2006.